This is an interesting report for anyone who does stowage planning. It will become even more relevant as the number of large vessels increases, increasing the chances of similar incidents since average stack heights will increase. 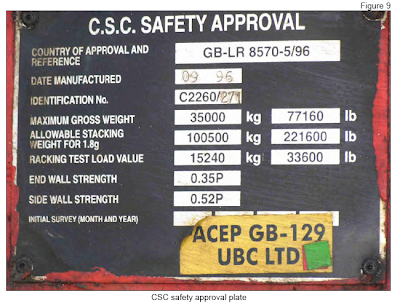 The ACEP sticker means that the container is part of an Accepted Container Examination Program. 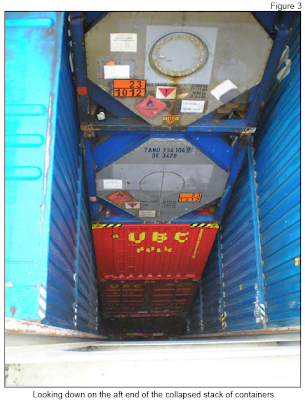 The owner of a container is responsible for maintaining that container in a safe condition and must arrange for a container to be examined in accordance with certain procedures and at prescribed intervals for the purpose of determining whether the container has any defect that could place any person in danger. For leased containers, by virtue of lease agreements the owner or lessor normally transfers these responsibilities to the lessee. Of course every shipping line has different standards. Eagle Speak has "More secure containers?". Also, be sure to check out his weekly series "Sunday Ship History: The Inchon Invasion, September 1950"
Maritime Accident Casebook has the special report "The Case Of The Killer Catch". Once again the instrument of death is the lifeboat which takes the lives of two seafarers during a safety drill. The report lists a number of good points about how needlessly complicated the gear is for attaching and releasing the falls from the lifeboat. Personally I tend to prefer the old open boats with the single lever marked "DANGER LEVER DROPS BOAT". With the open boat, it is easy to see that you are in the water and permits easy access to the falls. Also the hooks can be secured before attaching the falls. Surely this system was not perfect, but at least you were not trapped inside, and provided that the 'manropes' were maintained, you at least had something to hold onto in case the lifeboat dropped out from under you. Imagine being in this lifeboat as the ship rolled. gCaptain has what is apparently bad news to a number of US Merchant Mariners who were a little creative with their work-related meal 'expense' deductions with his post "Mariner Tax Deduction “Kapp-sized” By IRS". (For those who don't know, the ship provides your meals at sea, at no additional cost to you.) The relevant part is that the Government is demanding names of clients back to 2000. That sounds somewhat unfair to me, because I was under the impression that they can't go after you for more than 3 years back as long as you file. Anyway, gCaptain promises to keep on top of the story here. I was originally going to link to this gCaptain article "Aw Nuts! By The Artful Blogger". To better understand the barrel reference, look here, but only if your not easily offended. (If you are easily offended, you are at the wrong corner of the internet.) Hmm, who knows, maybe the barrel reference will also apply to the other gCaptain post. Superferry has announced that they will restart service between Kaua‘i and O‘ahu starting on September 26 and have posted on their website "the Summary of State Law Consequences" (PDF Document) (which includes Federal charges for interfering with the Coast Guard). The list was released by the State of Hawaii as a warning to protesters who might consider breaking the law, again. The Economic Times (India) has the latest on the BLUE LADY scrapping battle in "Blue Lady's fate uncertain as activists to challenge SC". Apparently, it was finally approved because the vessel had already been beached. The Oregon Telegraph has the expected reaction from the environmentalists in "Rights and environmental groups condemn Blue Lady ruling". Technically, this should be an internal Indian matter since the owner of the vessel is an Indian Shipbreaker, who planned to profit from recycling the ship. Go here for Flickr photos of Alang Ships. The Pilot Boat brings in the dead ship/Portuguese ferry ILHA AZUL for repairs. Shipping Times (UK) has "Scottish Government urged to abolish fishing fleet 'slave labour'" noting a number of severe abuses on EU-Registered fishing vessels. 'Manoeuvre' in Maritime Asia has "Taiwan to Construct Spratly Air Base". There is a small issue in that China has also claimed the islands for themselves as do a number of other countries. Back in school the big NAVTAG simulation involved the Spratley Islands. My watch actually won the event by kamikaze-ing our last jet into the Chinese troopship sent to occupy the islands. The instructor thought it would be amusing to enable the kamikaze option but never thought that it would be the deciding factor in the game. Tims Times posts a sea story from his first arrival in the US. The story is titled "Divine Intervention"
Robin Storm takes a good look at remotely operated underwater vehicles including how they assisted in the salvage of the M/V BOW MARINER. Logistics Management has one company's switch from shipping cargo from Air to sea in "Ocean shipping strategies: Risk versus reward". In many cases, shipping by air is not as fast as you would think it is. That is a problem for the air carriers as moving cargo by sea is getting faster. The Daily Dispatch (South Africa) has a list of accidents off the Eastern Cape Coast of South Africa in "WILD COAST: The ship wrecker". Sailor Girl (Atlântico Azul - Paixão pelo Mar) invites you to participate in Royal Race Regatta on 5 October, 2007, in Portugal. MarEx Newsletter has "Flag State Activities Crucial to Promoting Safety at Sea"
DC Examiner has a story on the Baltimore International Seafarer’s Center. Their website is located here. Titanic International Society’s Web Log has "Coast Guard appoints first woman to command Ice Patrol". That would be US Coast Guard LCDR Gabrielle McGrath. 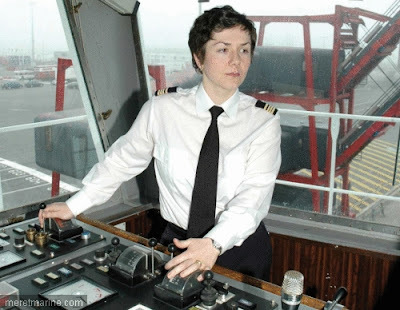 UN Atlas of the Oceans has Captain Caroline Lallement, the first female Ship Captain in France. (So it claims.) For those who can manage, the French language story can be found here. The Boston Globe has the story of one entrant to the upcoming Vendée Globe around the world alone race. Environmental News Network has "Indian Ocean sees smallest tuna catch in 11 years"
SAILORS, MARINERS & WARRIORS LEAGUE has "the claim by and Animal Rights Group Saying that it sank the Whaling Ship WILLASSEN SENIOR in Norway. Steeljaw Scribe has the firing by Russian President Vladimir Putin of Russia’s Navy Chief, Admiral Vladimir Masorin, possibly for accepting an award from the US Chief of Naval Operations. National Public Radio has a photo essay and radio presentation "Exploring for Oil in the Arctic's 'Great Frontier'"
Maritime Links Editor's Blog has "Maine Maritime Academy Enrollment at All Time High!" Hmmm, seems like a trend. Maritime Compass posts about the arrest of the former facilities director of Mystic Seaport, Cindy Snarski, for stealing thousands of dollars of copper wire. Tugster has the Dutch-Flag, US-based canal boat GOLDEN RE'AL. The Canadian Press has the head of the Canadian Navy, Vice-Admiral Drew Robertson state that the Navy needs to learn how to fight pirates and terrorists. 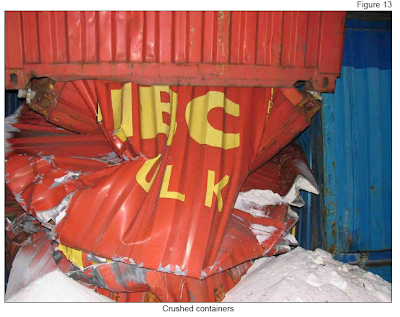 With yet another example of why Greenpeace should be thrown out of the International Maritime Organization (IMO), again, and just in time to back up the statements of Canadian Navy Vice-Admiral Robertson, is their post "Pulp freighter blockade in Canada"
Where are the fire hoses? - Use fire hoses and fire monitors. Add Foam or soap to make everything slippery. Deliver the soap inside water balloons and then use the hosed to foam it all up. - Use the anchor wash if there is an attempt to secure themselves to the anchor chain. - Use paintball guns. For more effect, shoot Pepper balls. - Have the engineers whip up a couple potato cannons. Instead of potatoes, you can try ice cubes for a shotgun effect. - Make use of expired flares. Just don't shoot them skyward. Read "Cheating death (Lloyds List)" for the amazing story of the survival of the entire staff of the American Bureau of Shipping who escaped from the 91st floor of the first World Trade Tower to be hit. The plane hit right above their floor and nobody escaped from any of the floors above them. Finally, EU Observer has "EU abandons metric conversion for UK and Ireland". 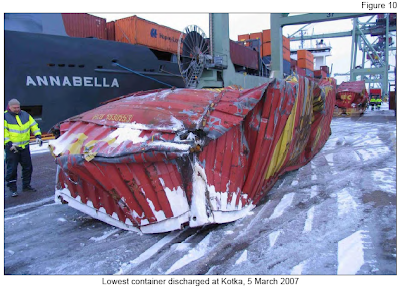 It seems that Norway is determined to kill off their shipping Industry by burying it in taxes. I read that ABS article few years back, truly amazing! Thanks for remembering the day, here's the memorial site for the guys lost from my father's firehouse. Thanks very much for posting the invitation for the Royal Race! Do you think you could come? It's not very far away! It's in the Tagus River (Lisbon, Portugal)!!! "Do you think you could come?" Actually, I will be in Finland for two weeks in October. Close, but not close enough. I was in Helsinky in 1988, for the Cutty Sark Tall Ships Race (Helsinki-Mariehamn-Copenhagen) and have lots of good memories!! Have a nice stay there!! If you come to Lisbon please inform, we will welcome you and show the town, the river and the sea here. USCG: "Sponge Bob 'stops up' sinking vessel"